Welcome"Lazarus Jones Save Our Children Campaign was founded in 2009 and became a 501(c) (3) nonprofit organization in 2011". We are a community service center for families that have experience trauma through violence acts. We provide counseling and networking. Lazarus Jones Save Our Children Campaign creates blessings and inspiration. Love to support too parents and family members who has lost a love one do to violence. Our hearts desire is to stop the violence in order to prevent other parents from experiencing the pain of burying their children. We welcome parents and their children into a warm loving and peaceful environment. We focus on improving safety within our communities by empowering parents to encourage thier children to focus on the positive side of life and stepping out to make a difference. We are preparing a business plan to grow our organization into a household name. This is just the beginning. We will like to raise enough money to develop the detailed marketing, revenue stream and operational plans required to secure the remaining capital to become financially self-sufficient. We march against violence, choking back tears long enough to become a voice for my son. It has been painful, stressful and now having (PTST) Post Traumatic Stress Disorder. I experienced a tremendous amount of anger, and I almost lost my faith in God. I told myself, I am his mother and this is what I have to do. The death of my son took a hunger and love from the pit of my soul that inspired me to be an activist for the safety of all children. The days that followed Lazarus murder were a blur of tears and sleepless nights, funeral plans and flashes of memory that never leaves my mind. Currently, since the beginning of the school year in September, of 2007 at least 32 Chicago Public Schools students have been killed. My son Lazarus was among the students that were kill do to violence all was under the age of 19teen years of age. 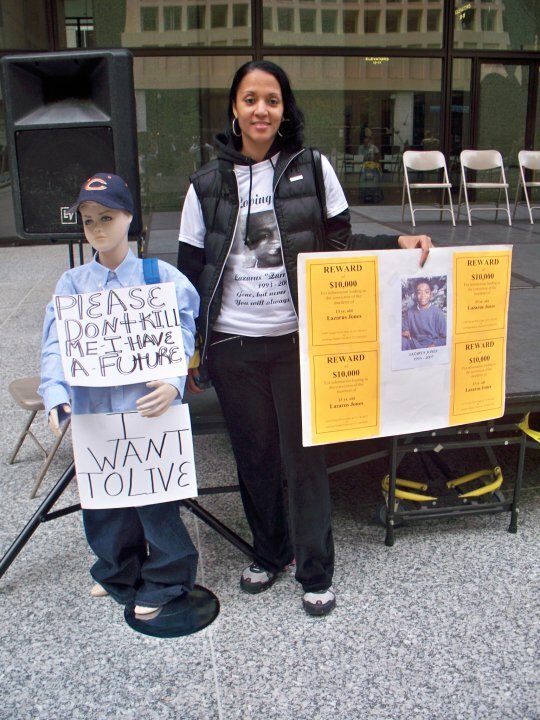 In 2008 there were 45 Chicago Public Schools students killed. And the number goes up even more September 24, 2009 the day Derrion Albert was killed 76 children 18 and under has been killed in Chicago to date. Most died from gunfire. Most was young black males. All were children of our city. When will enough really be enough? As a parent that has lost a child and seeing other parents losing their children can have a deep and profound impact on the entire family and the community .This kind of stress create a strain that is exhausting for all family members leaving little time or energy for creating joy. I discovered that many parents have shared their pain and thoughts with me. Many of the parents, however, had never had a parent to have lost their on child give to them the confront joy and love to another. That God has giving to me to give back to a parent or a family member. THANK YOU ALL FOR YOUR DONATIONS AND BLESSINGS WITH LOVE!!! In order to save our children we must make an improvement. On safety and create a stronger united and loving community. For the future of our children education and new generations to come. God is with us all we must believe in his power.